Just like a real snowflake, this perfect gift is unique to the location it is made from. Whether it was a childhood trip, where he proposed, where you spent your honeymoon or a summer abroad, Dune Jewelry captures those memories from where you've been and where you love. Select a sand from your favorite beach, ballpark, golf course or trail from Dune Jewelry's extensive sand bank to be hand crafted by Sand Artists into a one-of-a-kind piece. Every piece is custom made to order, using the highest quality materials sourced from around the globe. Inlaid with Your Chosen Sand (One Sand Choice). Gift Box Including Information Card and Jewelry Care Instructions. Ornament Measures Approx 2.75" in diameter. 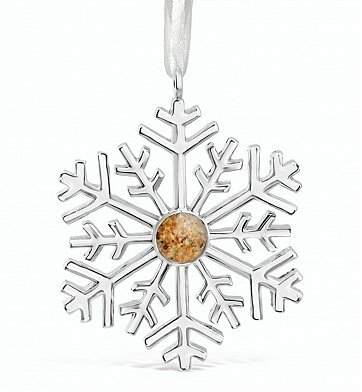 Dune Jewelry Snowflake Ornament is a hand delivered gift. These gifts are delivered by one of our local design centers located throughout the United States and Canada. Same day delivery is available for most gifts when ordered before the cutoff time. The cutoff time for Dune Jewelry Snowflake Ornament is in the recipient's time zone.